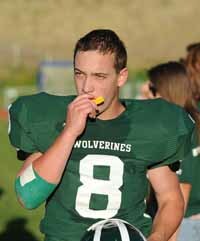 Falling behind 13-0 in the first half, the Wood River High School varsity football team rallied with determination for a 22-19 fourth-quarter lead over Sugar-Salem in Friday's 2011 grid opener at Hailey's Phil Homer Field. But 6-3 junior Devin Smith hauled in a 68-yard touchdown pass from sophomore quarterback Teancum Gibson in the final 30 seconds lifting Sugar-Salem (1-0) to a 25-22 non-conference victory. Senior Greg Lindbloom scored all three Wood River touchdowns Friday on 5-yard, 9-yard and 8-run runs, and he added a two-point conversion run giving the Wolverines a 22-19 lead in the fourth quarter. Gus Conrad added two extra-point kicks, and Trevor Brand missed a potential game-tying 47-yard field goal with no time left on the clock—after a fine kickoff return by Austin Hafer. With a strong line charge, Wood River piled up 175 rushing yards. This coming Friday, the Wolverines (0-1) are back at home for a game against longtime rival Buhl. It will be Buhl's first game. Opening kickoff is at 7 p.m.
More updates about last week's game against Sugar-Salem in Friday's Idaho Mountain Express.